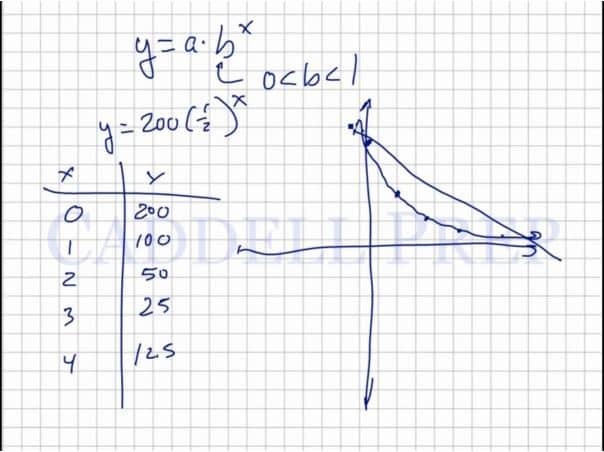 In this video, we are going to look at exponential decay. For a graph to demonstrate exponential decay, the base of the exponent, b, must be between 0 and 1. These graphs decrease by a factor, and will not fall into the negatives. curves slowly downward after plotting points as shown in the video, and demonstrates exponential decay. This graph decreases by a factor of . Let’s go over exponential decay. Exponential decay is when something decreases by a certain factor over and over again. You may see this in a chemistry problem or something like that nature. We have g of something. It decreases half of the amount so now we have g. Then decrease by half again, we have g. Then decrease by half again, we have g. Then decrease by half again, so we have g. And so on. Here, it decreases by a factor. It is very different with a linear decay. Where we have g and when we decrease it by g, we’ll have g. And if we decrease it by g again, we’ll have . Or let’s decrease at g.
So we have g then decrase to . Then decrease again by , we’ll have . In exponential decay, we keep decreasing and the amount we decrease by also keeps on decreasing. Whereas in a linear decay, it keeps on decreasing by a certain amount over and over again. In exponential decay, . So its somewhere between and . This one models the one we have before. Whereas decreases by over and over again. So initially, at time , we have . But if we have a linear decrease, we’ll have a straight line decrease. The exponential decay line will not pass through the axis. Whereas, the linear decay line will go down into the negatives.